QuickBooks is essentially a desktop program, designed to be installed on your local computer. That is fine if you always work out of your office, and if all of the people who need access to the data are connected to the same local area network, but what if you need “remote” access, via the Internet? One option to consider is QuickBooks Hosting. Accessing your computer with a remote access tool like GoToMyPC or LogMeIn. There are a number of products that provide this – you leave your office computer running, then log in to it from another computer via the Internet. This works fine for occasional access, but it can be slow. Also, it means that you have to leave that office computer running while you are gone, and that can pose a number of security issues. This works for occasional access by a single user, but not as well if you do a volume of work or have multiple people working from different sites. 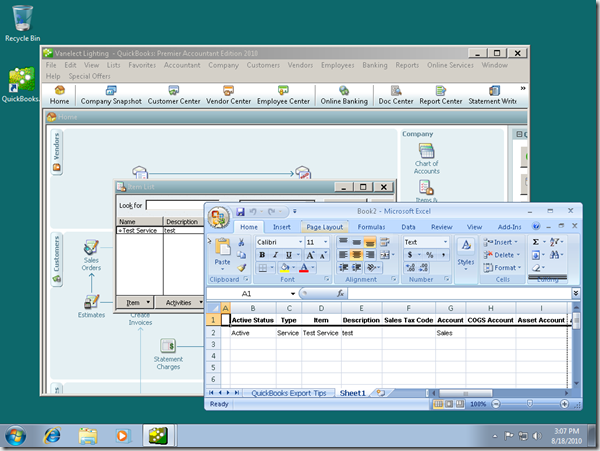 Using Windows Remote Desktop Services, also known as Terminal Services. This can allow you to access your system from a remote location, but there are costs. 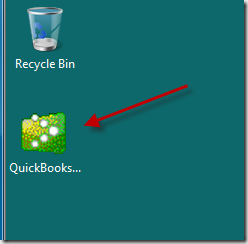 QuickBooks only supports this if you are using the more expensive Enterprise version. In most situations you need to set up a complicated Windows server system, and possibly pay higher fees for user licenses. This kind of system is not one that is easily set up (and maintain) unless you are technically proficient. QuickBooks Online Edition is another option – but note that this is not just an online version of QuickBooks Desktop – this is an entirely different product. The features are different, the user interface is different, the list of additional services is different, the selection of add-on and third party applications is totally different. You may find that this product does not provide the features you need. QuickBooks Hosting is an entirely different approach. Essentially what you are doing is paying a monthly fee to “rent” access to a copy of QuickBooks that is running on a remote server somewhere. You access your data via the Internet, the hosting company takes care of all of the technical aspects of things. When done right, QuickBooks Hosting can offer the same functionality as having the complete installation on your desktop. 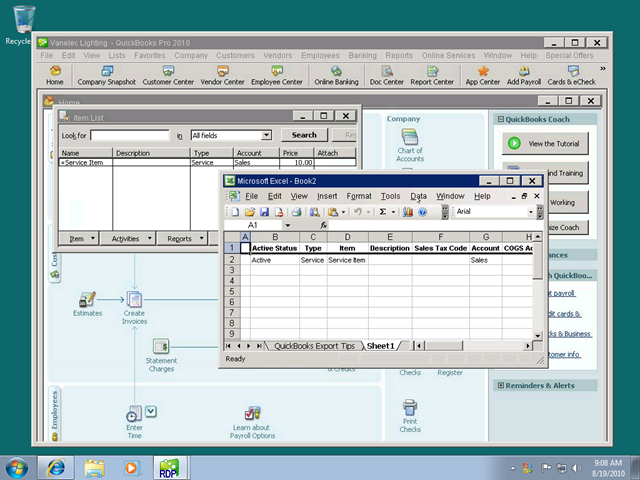 You should see a QuickBooks screen that is the same as you would see if it was installed on your own computer. I was provided demo accounts by NovelASPect and myownasp.com (update – this service is apparently no longer available). Both are hosting companies that provides a number of different applications. With NovelASPect you install an application from Citrix on your computer. This doesn’t take long, and is a very simple process. It doesn’t take technical proficiency to set up – just an Internet connection and the proper login credentials. Once the installation is complete you will have an icon on your desktop. Double click on the icon and you are running your copy of QuickBooks on the remote server. I was able to run all internal QuickBooks functions normally, including being able to export information to Excel and save invoices as PDF files. QuickBooks itself is not installed on my local computer – I just have a remote access window into the server of the hosting company. I can access this from anywhere in the Internet if I have my laptop with me – and possibly with other devices as well. myownasp.com performed very similarly. Instead of using Citrix, they use Provision by Quest, a company that competes with Citrix. 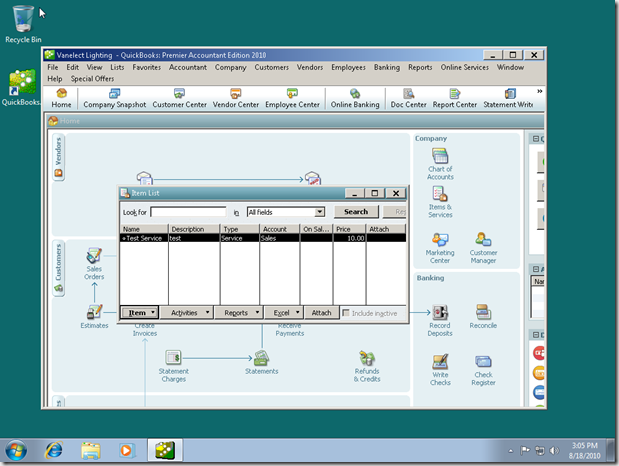 In the demo account the login and installation took more time than with NovelASPect, and it was a bit more involved. However, if you have installed any other program in Windows (such as QuickBooks or Microsoft Office) it wasn’t a difficult chore. If you have a full account with myownasp.com you would get an icon on your desktop – for the demo you have to log in online each time. 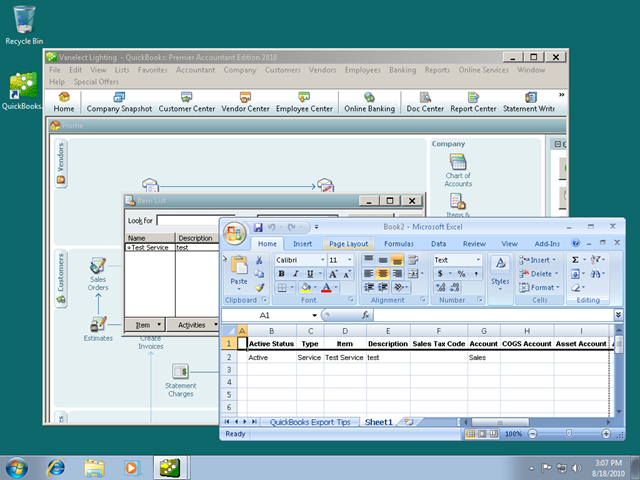 I was able to perform all of the tasks I tried when using myownasp.com, including exporting to Excel and saving invoices as a PDF file. It was interesting to compare the two hosting companies. Response time is always an important feature to me – I hate waiting for things to update on the screen. It is difficult to compare programs when you access them at different times of the day like I did – Internet speed varies (at my location) quite a bit during the course of the day, and it is possible that the response time of the Hosting company server could vary at different times depending on the loads they are supporting. In my simple tests I found that each Hosting company performed well, but that certain operations were slower on one than on the other. 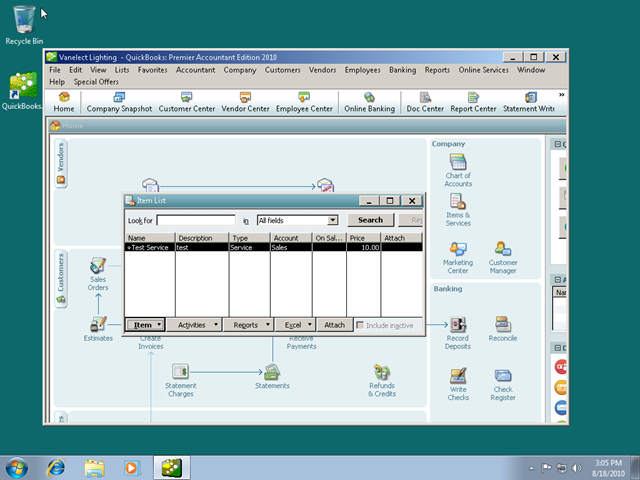 Moving from window to window within QuickBooks was faster on myownasp.com, but exporting to Excel was much faster on NovelASPect. Again, I didn’t test them under the exact same conditions, so there could be many factors that would affect things. You will, however, notice that the programs seem to be a bit slower when using a Hosting company than if you have them installed on your own computer, IF you have a fairly up-to-date computer with a lot of memory. My comparison may be a bit unfair, my own system is a 64 bit computer with 24mb of RAM, so it is very fast. However, I did notice that the responsiveness of these two Hosted solutions was faster than what I see when I use a remote access product like GoToMyPC. Access from anywhere: As I mentioned above, you are not tied to your office computer or network. Anywhere that you have a computer and access to the Internet you can work with your files. You can even access your data if you have a Mac. Speed is usually limited by how fast of a connection that you have. Convenience: Unlike remote access programs like GoToMyPC, you don’t have to leave your office computer on while you are away. Every user who has an account can see the data, and it is the same database for everyone. If you are accessing it from your home office, a co worker can be accessing it from the main office as well. No moving files about, no worrying about “synchronizing” or making backups. If you are an accountant working with client files both you and your client have access to the data – you don’t have to work with messy “accountant’s copy” procedures, or worry about having the same version of QuickBooks installed as your client. Reduce IT Costs: You don’t need an in-house IT department – the Hosting company takes care of the technical aspects. They maintain the computers and the installation of the program. They take care of daily backups and data security. Access data with any computer or device: Depending on your QuickBooks Hosting company, you may be able to access your data from other kinds of devices, such as handheld devices or “thin clients”. Do the company specialize in QuickBooks Hosting? There are many Internet hosting companies out there that are very reasonably priced, and they can provide any kind of program you want – but if they aren’t specifically in the business of QuickBooks Hosting, I wouldn’t recommend using them. QuickBooks Hosting is a very specific kind of process. Intuit has a program for authorizing official QuickBooks Hosting companies- make sure yours is authorized, or at least in the process of being authorized (this is a relatively new program so many are still in the process). Can I run Third Party applications? You might not need this, but maybe you will. Ask if your QuickBooks Hosting company supports “SDK” based add-ons, as well as “IPP” based add-ons. Many SDK based applications are in use by many businesses to resolve shortcomings in QuickBooks, so you may want to be able to use them. Intuit is providing more and more services through the IPP interface, so this is becoming more important as we move forward. What is the ability of your host to support these, and at what cost? Will the QuickBooks Hosting company manage all program updates, and will they notify you of changes? If you are in a multi user situation managing updates of QuickBooks is a major hassle. If you are using a Hosting company you shouldn’t have to worry about this, BUT you want to know when they make an update! Can I get Local Backups of my files? The Hosting company will be making backups (check on their scheduling of that), but I believe that it is important that you have the ability to make your own backups to save for yourself. Can this be done? Is there a cost? Is Your Data Center Secure? That is a tough one – every Hosting company will say “yes, of course!”. As we have seen lately with Intuit’s own servers, service outages can occur and they can be crippling. Evaluating the claims of the Hosting Company can be tricky – I hope to have an article on that sometime in the future. What are their backup procedures? What is there outage history? Do they have redundant servers? Do they have mirrored sites? Will this work with my own installation of Microsoft Office? Do you have to pay a fee to add this, or will it work from the installation on your own computer? I believe that in most cases you will have to use their installation of Office, and you may have to pay an additional fee for this. Do I have to pay for a license for QuickBooks in addition to the monthly fee? Is QuickBooks included in the price plan, or do you have to provide them with a registration number for a copy of QuickBooks that you have purchased? I believe that in all cases you will have to buy your own licenses for QuickBooks and provide the registration info to the host, but you should check on that. Do you support the version/edition of QuickBooks that I need to use? I have not worked extensively with many QuickBooks Hosting companies at this time – so if you have had any experiences with one, good or bad, I would appreciate it if you can add a comment here about your experience. I’ve tested NovelASPect and their service seems to be reasonable. Installation on my system was very simple, speed of service was acceptable, they have the ability to work with SDK and IPP apps (but for an additional fee). I was able to export information to my own computer via Excel without problems. The service is available for $50 per user per month, plus the cost of your QuickBooks license. Based on my initial contact and testing, this looks to be an excellent QuickBooks Hosting company. I’ve also worked with myownasp.com in both a demo as well as on some programming projects. Performance was similar to NovelASPect. I know that they are able to work with SDK apps, as I have been providing them with that kind of product for one of their clients. I’ve been impressed by their technical knowledge of QuickBooks while dealing with them. The service is available for $35 to $75 per user per month, with a three user minimum. You get a variety of features depending on the plan you purchase. Nice article on QB hosting. I have been using RightNetworks for over 2 years now. They are authorized to host QB by Intuit. They have been responsive to my requests and for the most part the experience is adequate. Yes, there are times when due to internet traffice is does seem to slow down, but for the most part it works great. What I like is offloading the IT headache to them. Plus I don’t have to worry as much about backups. Thank you, Steven. I’ve known about RightNetworks for some time, I just don’t have experience with them. But, I’ll quibble with you on one point. You STILL have to worry about backups, on several levels. Yes, they are backing up your data regularly, but you need more than just a daily backup. You need archival backups at period ends. You need a series of backups in case you find that there is damage in your company file (which may have just been backed up!). And the hosting company is most likely not doing a “QuickBooks Backup” so your transaction log is not being resolved (see https://qbblog.ccrsoftware.info/2010/08/what-is-the-quickbooks-tlg-file/ ). I’m a little confused – is it not possible to host the company file somewhere and then access it from the desktop app? I guess I don’t really understand the need to remote access the actual application as opposed to just the company file? Kate, QuickBooks isn’t designed to work in the fashion you talk about. There is a “database manager” that accesses the database file, and they need to be on the same computer. If not, performance is very bad and you get errors (for a number of reasons). 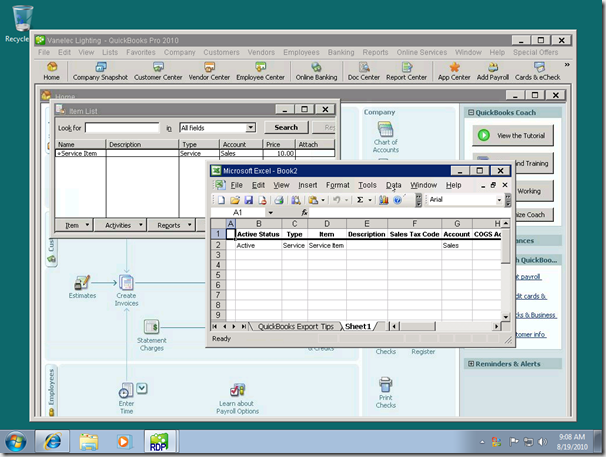 Then, QuickBooks clients need to have quick access to the database server. If they are trying to go across the Internet, you will get timeout errors. Intuit didn’t design it for that kind of access, they expect a rapid response to the data query and if they don’t get it, they fail (or worse yet, you get data corruption errors). « What is the QuickBooks TLG File?